You are at:Home»Activities & Entertainment»Wildlife Watching: What Will You See On the High Seas? Wildlife Watching: What Will You See On the High Seas? When people imagine a cruise holiday, they likely picture passengers doing nothing more than lounging in the sun, gorging on mounds of inclusive fodder, before heading inland for a spot of sightseeing. But there’s more to cruising than that, right? Right. While there’s certainly ample time to catch some rays and graze at the buffet during your trip, cruise holidays offer passengers so much more – like the opportunity to spot rare, endangered and altogether beautiful wildlife, for example. From whale sharks and dolphins to kiwis and tigers, in this guide, we’ll be filling you in on the wildlife you’re likely (or sort of likely) to see on a cruise break in Australia, New Zealand or Southeast Asia. Australia may be famed throughout the world for its deadly snakes and spiders, but us Aussies know there’s more wildlife to see than creepy crawlies. Here, we look at some of the critters you’re likely to spot should you book a cruise in Australian-waters. Whilst Humpback Whales spend the majority of their life in polar seas, they are known to pass Australia’s West Coast en-route to sub-tropical breeding grounds. Labelled the ‘gentle giants’ of the sea, Humpbacks can grow up to 20m in length, making them easy to spot should they surface beside your ship. 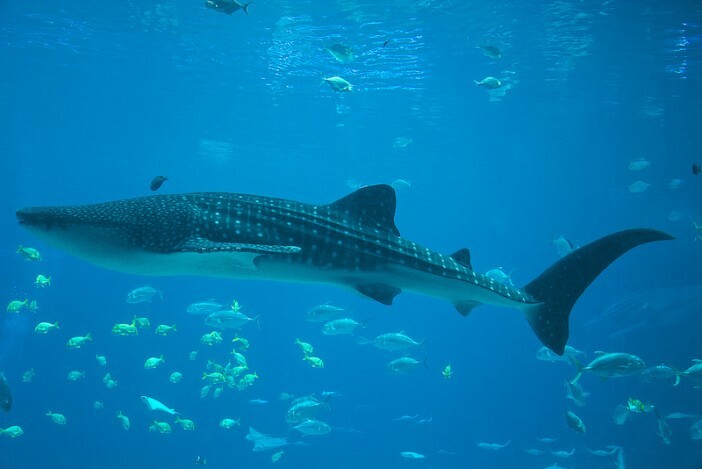 Despite their imposing scale, Whale sharks are harmless creatures that prey on krill rather than humans. It’s this diet that attracts these polka-dot beasts to Australia’s shores between March and July each year; they visit to fill up on krill, which are enticed by Australia’s brightly coloured reefs. Unless you’re someone that considers them a pest, most Aussies would be thrilled to see a kangaroo frolicking about in its natural habitat. As the name suggests, the best place to see ‘roos is Kangaroo Island; a popular cruise port located seventy miles south of Adelaide. Another national treasure capable of warming the cockles of many an Australian resident is the Koala Bear. Found in coastal regions of Queensland and Victoria, Koalas are notoriously difficult to spot in the wild. If you’re keen to see one, visit The Rainforest Habitat whilst your cruise ship is docked in Port Douglas, Queensland. The country’s national symbol may be a small flightless bird, but that doesn’t mean New Zealand lacks notable wildlife. Don’t believe us? Here’s a look at some of the wildlife you might chance upon during a New Zealand cruise holiday. Ever wondered what the largest animal on earth looks like up close? Book a New Zealand cruise break, and you might find out. Marine biologists believe a colony of Blue whales spend much of the year off the coast of Taranaki in New Zealand’s North Island. For the best chance of seeing these magnificent mammals, book a whale-watching excursion when you call to port. Despite their deadly namesake, Killer Whales are naturally friendly and inquisitive thanks to their close relation to dolphins. That means, it’s likely they’ll find you before you find them. To ensure a sighting, book a day trip to the Hauraki Gulf Marine Park during your Auckland port call. No New Zealand wildlife tour would be complete without mention of the country’s famous flightless bird, the Kiwi. Found in many of NZ’s national parks, Kiwis are no bigger than a chicken yet lay huge eggs in relation to their scale. If you’re interested in seeing a Kiwi in the flesh, head to the National Aquarium of New Zealand in Napier. Though Leopard seals spend much of their life on Antarctica’s pack ice, the winter forces them to seek warmer climates – thus bringing them to New Zealand. As the second biggest seal in the Antarctic, leopard seals have garnered a fearsome reputation thanks to their massive jaw and row of razor sharp teeth. For your chance to see these enigmatic predators in the wild, head to Auckland at the tip of New Zealand’s North Island. Thanks to its bio-diversity and climate, Southeast Asia is home to all manner of life – much of which is yet to be discovered. Here, we explore some of the exotic wildlife you’re likely to see on a cruise holiday to Vietnam, Indonesia or Thailand. If you love dolphins, you’ll be well catered for in Asian waters. Dolphins are prevalent in coastal waters across Southeast Asia – particularly around the Banda Islands of Indonesia. Thanks to their friendly and curious temperament, dolphins are known to approach cruise ships, making them very easy to spot. The Great White Shark may be the most feared shark in the world, but in Asian waters, it’s the Bull Shark you should fear. Bull sharks are one of the only breeds of shark to spend a large majority of time in tropical waters, and they’ve particular fondness for shallow, coastal waters. The Komodo Dragon may look like a creature straight out of Jurassic Park, but they’re very much alive and kicking. Located on a select few islands in Indonesia, the Komodo is the largest lizard on earth and much revered by local people. Surprisingly, it’s relatively easy to see a Komodo in the wild; simply book a trip to Komodo Island, a UNESCO World Heritage Site that’s home to a number of these unique predators. If you’ve yet to see a monkey in the wild, chances are you’re about to. Most countries within Southeast Asia have a significant monkey population given that many cultures consider them sacred. During an Asian cruise break, Vietnam is the most likely place you’ll see a monkey or two. So there we have it – just some of the wildlife you’re likely to see on your next cruise break to Australia, New Zealand and Southeast Asia. For more tips and advice on cruise travel, be sure to check out the rest of the Cruise1st Australia blog. Alternatively, if you’re interested in booking a cruise holiday with us, click here to visit our homepage and browse our range of upcoming cruise holidays.